All sections and ends include uprights, backs, lower shelves, kick plates, shoes, and shoe covers. Shelves are sold separately. Depth 48" 54" 60" 72" 84" 96"
What is a Wall Section and a Wall End? To create a Wall Aisle as pictured in the images on the top of this page you will use the Wall Section pieces below to configure your aisle length as the sections are available in either 3 or 4 foot sections and your will need an end to complete your aisle of Wall Aisle. A Wall End is used to complete a Gondola Aisle. For example a 16' Wall Aisle will consist of 4 Gondola Sections and 1 Wall End to complete the Aisle. A Wall Section includes 1 lower shelf, 1 upright, 1 upright cover, 1 base shoe, 1 hardboard back, 1 kick-plates, 1 base shoe cover, 1 upper spanner, 1 center spanner, and 1 lower spanner. A Wall End includes 1 upright, 1 base shoes, 1 base shoe covers, and 1 upright cover. 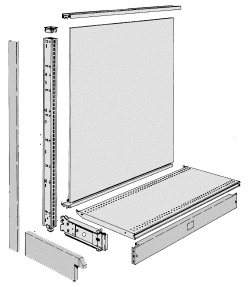 A Wall Mount Section includes: one Basic Upright with Cap, one Base Shelf, one Kickplate, one Back Panel and one Top, Center, and Lower Spanner. If the Gondola is 78" tall or taller, the section would also include one Splicer Spanner. Wall Mount shelving height start at 36 inches with a maximum height of 96 inches, a deck base starting at 12 inches wide and a maximum width of 30 inches. 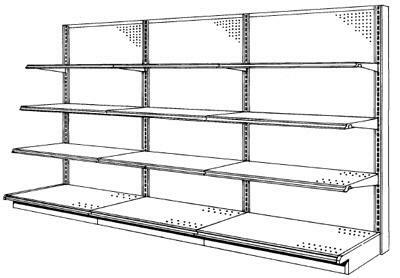 Wall Shelving is a great store fixture designed especially to display all types of merchandise for all types of stores such as: Hardware Store, Clothing Store, Beauty Supply Store, Convenience Store, Retail Store, Grocery Store, Pet Store, Toy Store, and more. Wall Sections may also be used as end caps. What is the difference between Gondola Store Shelving and Wall? The Gondola shelving is also called Gondola Island Shelving. Using the term island the Gondola Shelving stands in the center of the floor on as a island type product display. 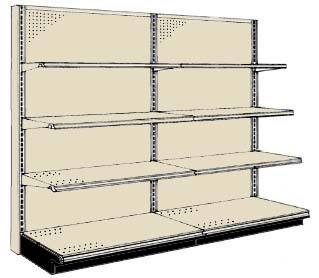 The wall shelving is store shelving that is installed against a wall. Choose the Shelf height that best suites your needs as far as visibility and so on. Choose the Shelf width that best suites your needs as far as visibility and so on. Maximum load capacity is 200 lb. when loaded one side only.